Every Pokemon is interesting and worth talking about. I don’t play a ton of Pokemon, but I do enjoy the universe and I love learning more about the creatures in it. So, Here’s Another Pokemon! It’s Ludicolo! This Pokemon was suggested by Kotaku reader ArchiteuthisReDux. Thanks! I love that Ludicolo has a hat built into its body. Between that festive body-hat and its colorful exterior, Ludicolo looks like a Pokemon who is ready to party, and party hardy. It’s good they look this way because this Pokemon will be dancing, even if it really doesn’t want to. 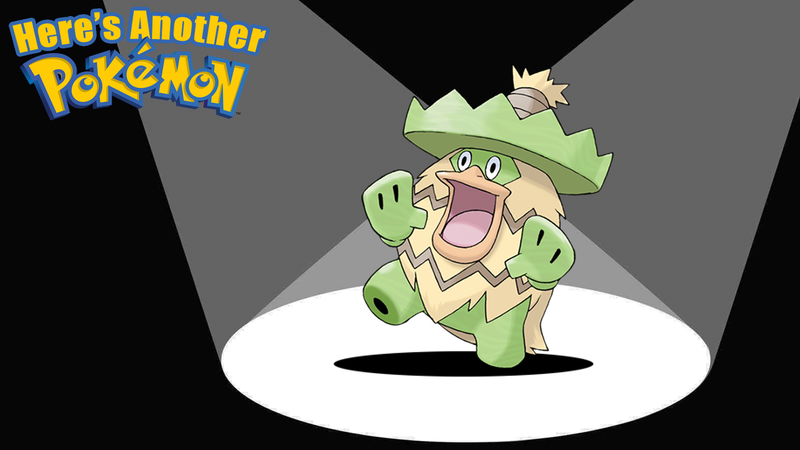 According to multiple Pokedex entries, Ludicolo will dance whenever they hear the music. Specifically festive music. Ludicolo isn’t here to dance to some non-bangers or somber tunes. They need some Bruno Mars to get jiggling. The thing is, this Pokemon might not even be able to control when they dance. As mentioned in this Pokedex entry found on Bulbapedia, “If Ludicolo hears festive music, all its muscles fill with energy. It can’t help breaking into a dance.” This seems like a situation where this poor creature might want to rest or relax and suddenly they hear some 24k Magic and just like that they fill with energy and begin gyrating. If I was a Ludicolo I would buy a pair of noise-canceling headphones. When they hear cheerful or fun music, not only does this Pokemon begin to dance but they also become more powerful. Ludicolo’s powerful dancing is something the Pokemon developers REALLY wanted people to know about. Usually, when I check out a Pokemon and their Pokedex entries, I’ll see a few things repeated. But almost every single Ludicolo Pokedex entry mentions it dances to music and gains power from doing so. 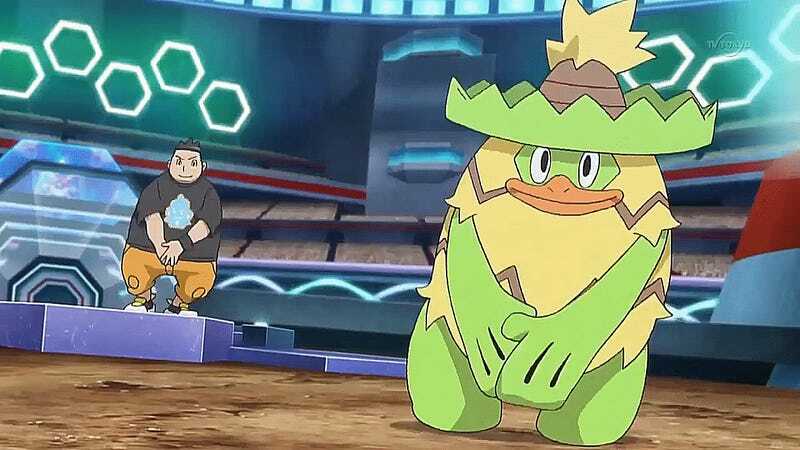 So here is a top tip from Kotaku to any trainers out there with a Ludicolo: Bring a portable speaker to your next fight and load up your phone with some hits and watch Ludicolo kill your enemy. Also, looking closely at images of Ludicolo, I’m really confused as to what their texture would be. What would it feel like to hug a Ludicolo? Some of it seems clearly hairy, but other parts are less obvious. I know Ludicolo appears in the live-action Pokemon movie coming out soon and I like the designs of most of the creatures in that film. But Deviant Art user Starlight created a piece of art that illustrates an idea I had about the upcoming film. What if that movie got made like 15 years ago and the cheapest solution to live-action Pokemon was people in suits? This might be what that Ludicolo would look like. So another thing Ludicolo does is follow laughing children in the woods. I’m not sure why, or for what reason but the Pokedex mentions this a few times. Actually, I’m not done with the laughing kids thing. Maybe the sound of kids is close enough to music that Ludicolo becomes curious? I’ve learned over the years that the Pokemon universe is dark. So my first reaction to hearing this stuff about laughing kids was to wonder how many made it back alive. In Germany, Ludicolo is called Kappalores. This seems to be a name that incorporates the German word kokolores, which according to the web means “tomfoolery.” That makes sense to me. This is a Pokemon I could see getting up to some tomfoolery. Previous Installments of Here's Another Pokemon!